Nov 29, 2011 - St. Michael’s Hospital will build five new state-of-the-art operating rooms and relocate patient beds from an 85-year-old wing as part of a 17-storey patient care tower approved by the provincial government today. The project will also allow the hospital to nearly double the size of its emergency department, which now sees close to 70,000 patients a year, about 1.5 times the number it was designed to handle. 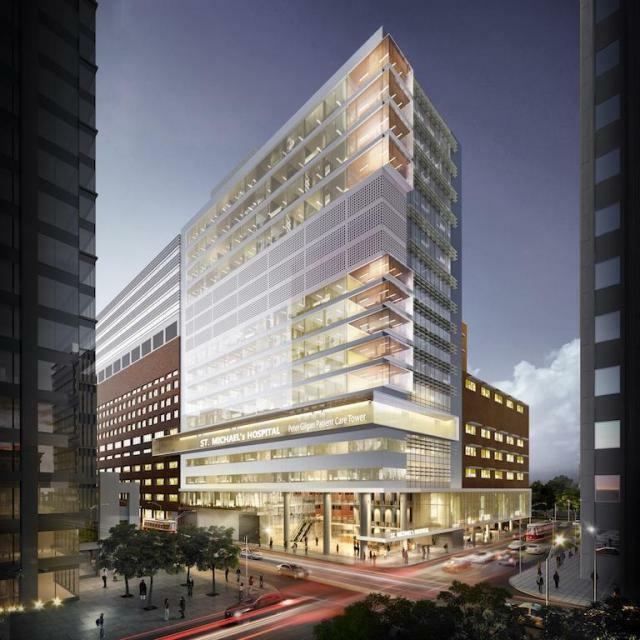 The tower, to be built at the northeast corner of Queen and Victoria Streets in downtown Toronto, will also provide larger space for programs that treat some of the most critically ill patients from across Ontario, including the medical-surgical intensive care unit and the largest adult cystic fibrosis clinic in North America. Improvements to patient flow will reduce wait times for a variety of services, including cardiac care, cancer care and surgeries, he said. Dr. Howard said that without the new tower, St. Michael’s was in danger of no longer being able to take advantage of new technologies necessary to provide quality patient care. Five new operating rooms, each big enough to include imaging equipment such as CT scans, which are an essential element of modern surgery. These “hybrid operating rooms” will allow surgeons to perform minimally invasive, image-guided or catheter-based procedures as well as undertake open surgery in the same OR. Not having to transfer patients to separate imaging rooms increases patient safety and decreases operation times. Enlarged, state-of-the art facilities for orthopedic surgery, coronary care and respirology, including the cystic fibrosis program. St. Michael’s Hospital was built in 1892. While the hospital recently opened its new research and education centre, the Li Ka Shing Knowledge Institute, the last major construction of new patient care areas was completed in 1996-- the first nine floors of the Cardinal Carter South Wing. The new tower will not require any new operations money for patient care and there will be no increase in staff, beds or programs. “We will be doing the same amount of work, only better,” Dr. Howard said. Construction could begin within two years and be completed three years after that. Other: entro, Priestly Demolition Inc.